In 1875, Owen Thomas, a poor Welsh coal miner, falls in love with a beautiful London actress, Jessica Lavery. He builds her a cottage in his village, and enchants her with the promise of the holidays they'll share after they marry. According to his special Thomas family tradition, the Christmas tree must always be outside, where it can look up to God. Owen carves her an angel to go on top of their tree, with lavender eyes like hers, a token more meaningful to her than any engagement ring. When Jessica breaks off their romance, Owen, broken-hearted, wraps the angel in his mother's shawl and brings her to America. There, she looks down over five generations, witnessing peace and war, triumphs and tragedies, reminding all who see her that Christmas is the time when families and sweethearts can come together, laughter and goodwill can lighten even the heaviest burden, and magic fills the earth. 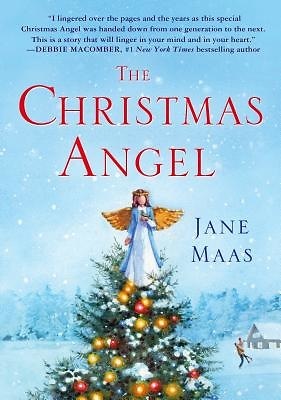 Jane Maas' book is a story of faith and love. And of the miracle that brought the angel home again.